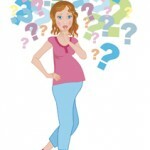 Home » Bleeding during pregnancy » Decidual bleeding or period? QUESTION – Decidual bleeding or period? I had unprotected relations with my boyfriend in the middle of my menstrual cycle and I was expecting my next menstrual period on 23 February. But I had very unusual “period” on 25 February – it was short and light. My friends told me it could be so called “decidual bleeding” and they advice me to buy a pregnancy test. How to check if it is my regular period or decidual bleeding? Many women can experience episodes of bleeding during first trimester of pregnancy – bleeding could be brown or red, light and short. Some women (mothers and grandmothers) tell about periods during first 1-2 months of pregnancy. But in reality it is not normal menstrual period but it is so called “decidual bleeding”. “Decidual bleeding” is the name for specific bleeding during pregnancy that may occur around the time that a pregnant woman would otherwise expect her menstrual period. The phenomenon is fairly rare (20-35%) and usually does not last longer than the first few months of pregnancy – this bleeding can be similar to a menstrual period and can occasionally prevent women from realizing that they are pregnant until other signs develop. During pregnancy the whole women health is changed dramatically and most women could recognize changes very early (even before the day of expected menstrual period). What is difference between decidual bleeding and regular menstrual period? Actually decidual bleeding is “period-like” bleeding during pregnancy – though this bleeding may resemble menstruation, it actually is something different altogether. What is period/menstruation? Normal regular menstrual period is an essential part of women health. During menstrual cycle women produce several hormones in very specific rhythm and these hormones signals to all reproductive organs – signals to follow biological menstrual rhythm to perform certain body biological actions. From the beginning of the menstrual cycle hormones are increasing and causing ovaries to release an egg that travels from ovary through fallopian tubes. Meanwhile, a protective layer of blood and tissue thickens along the walls of the uterus. If the egg is not fertilized (absence of pregnancy), hormone levels will drop, signaling body that it is the time to shed the lining that built up in uterus. This is what causes menstruation (so called “period”). During pregnancy hormone production is changed dramatically – all female body hormones and organs (especially reproductive organs) are completely focused on providing support for baby. The brain sends signals to ovaries to stop the menstrual cycle in order to insure proper environment for baby healthy development – as a result, instead of dropping, female hormones continue to rise for the next nine months. This helps the uterus prepare for the growth and nourishment of the baby. Sometimes during pregnancy women hormones can get out of whack, causing you to lose parts of the lining of your uterus – this is actually the decidual bleeding. This is especially common in the early stages of pregnancy, before the lining has completely attached to the placenta.